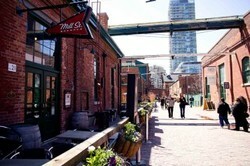 You'll meet our guide at the front gates of Toronto's Historic Distillery District (on Mill Street) to begin the tour. Beginning with a historic walking tour of the historic complex, we'll learn about the evolution of what was among the largest distilleries in the world. Taking in the 19th century industrial architecture along cobblestone streets, we'll hear fascinating stories of the Gooderham & Wort's legacy. Soon its time for our first tasting at IZUMI, one of North America's only authentic Japanese Sake Breweries. Our season is finished for the year. 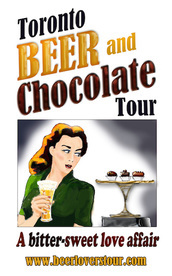 If you have an unused certificate, you may wish to contact us to upgrade to the Old Toronto Beer Tour which still runs till November. (10% off the difference). This tour is also available as a private tour (minimum 6). Izumi Ontario Spring Water Sake Co.
Izumi - Ontario Spring Water Sake Company is the first sake brewery in eastern North America. Using traditional Japanese methods and recipes with delicious Ontario spring water, visitors can now enjoy fresh, unpasteurized, locally-brewed sake for the first time. This addition to the thriving craft brewery scene in Ontario was launched with the assistance of the venerable Miyasaka Brewing Co., Ltd. who have been producing sake in Japan since the 1600’s! We'll have a 1/2 hour presentation of the Sake brewing process and enjoy a tutored tasting of 3 different variations of this traditional Japanese alcoholic beverage. 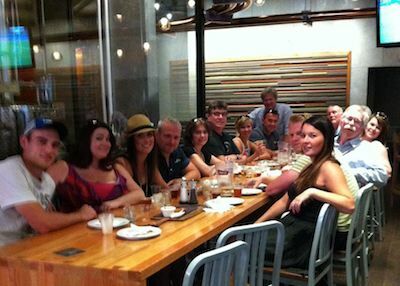 Following our tutored tasting, our guide will continue with our exploration of the historic Distillery District. Soon it's time for our chocolate immersion therapy at Toronto's famous SOMA Chocolatemaker. SOMA Chocolatemaker is a world-class chocolatier right in the heart of the city. In fact, SOMA is about as good as it gets! Here we'll learn about the chocolate-making process and sample the exquisite SOMA magic; an out-of-this-world "Chocolate Shot" accompanied by a hand made sample. 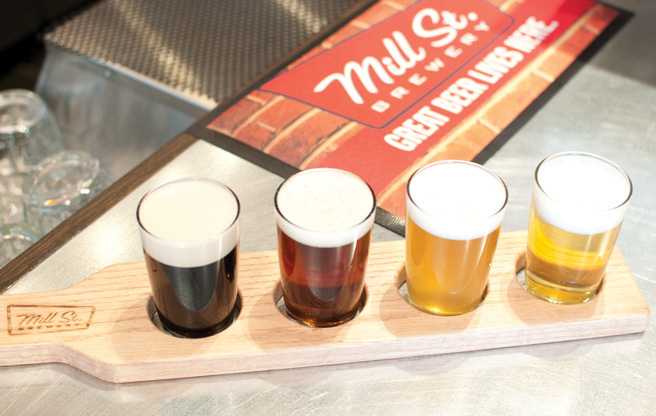 Mill Street Brewery Tasting "Flight"
Mill Street Brewery has been brewing award winning Lagers and Ales since 2002. Here at the original brewery, we'll enjoy a tutored tasting in the Mill Street Beer Hall, surrounded by the beautiful copper tanks of their shiny new nano-distillery. Along with a flight of four delicious beers, we'll also enjoy freshly-baked soft pretzels with Mill Street's home-made mustard. Last but not least, we'll also be treated to a sampling of "Bierschnapps", an old north German tradition produced exclusively by Mill Street. Tour ends at this location and guests are free to linger at Mill Street or continue with the rest of their afternoon exploring the Distillery District on their own. Perhaps dinner, gallery visits and live theater are in the plans. There are always lots of things to see and do in the Distillery District to make the day complete. This tour is available as a private group tour (minimum 6). Contact us for details. Our booking system will allow you to securely complete your purchase with any major credit card.